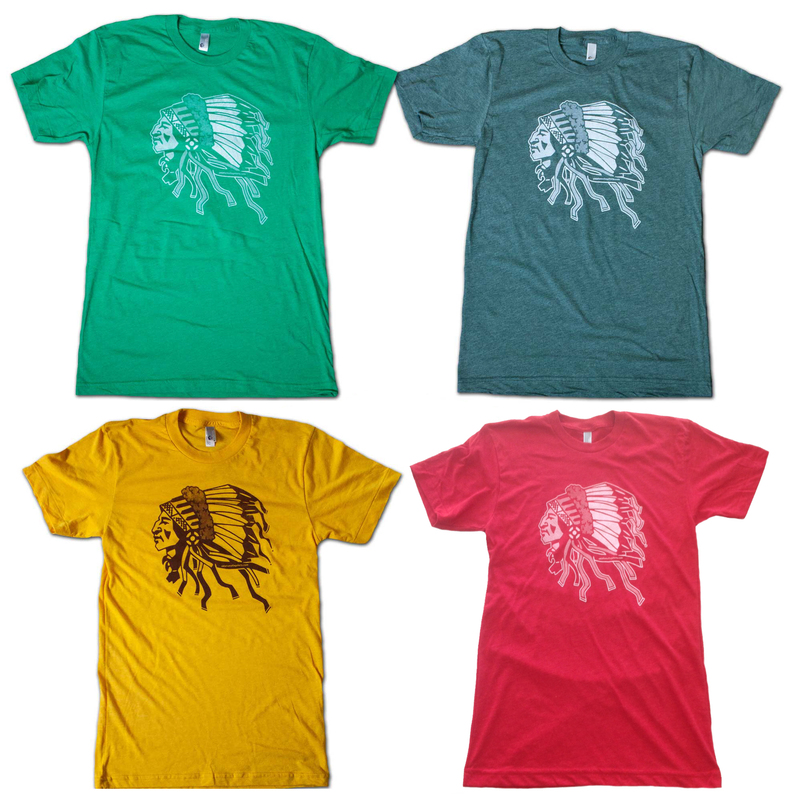 They're comfortable, they're classic, and best of all, they don't look like another damn cookie-cutter Affliction tee covered in two-dozen skeletons. 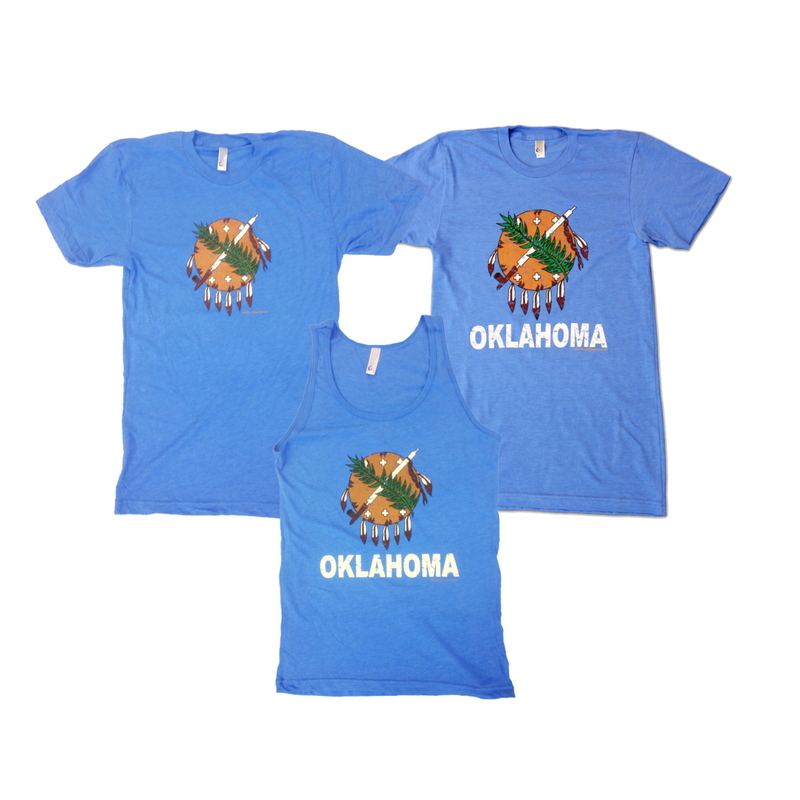 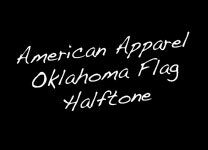 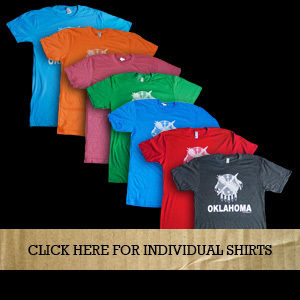 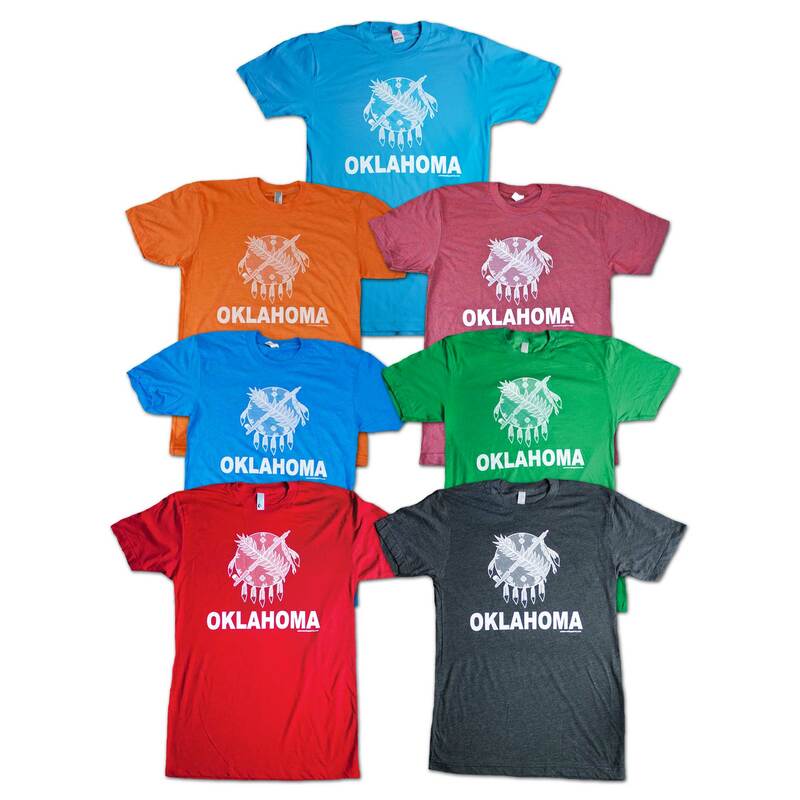 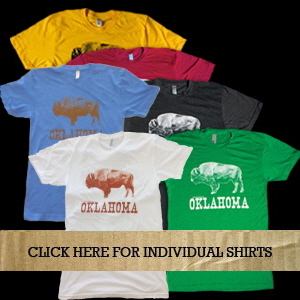 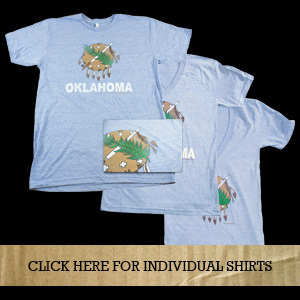 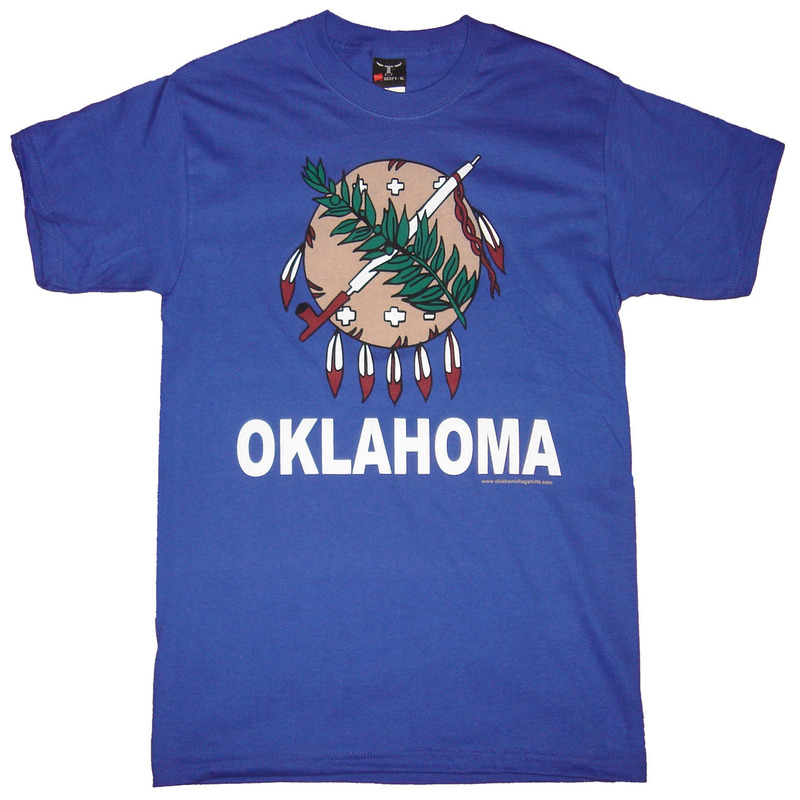 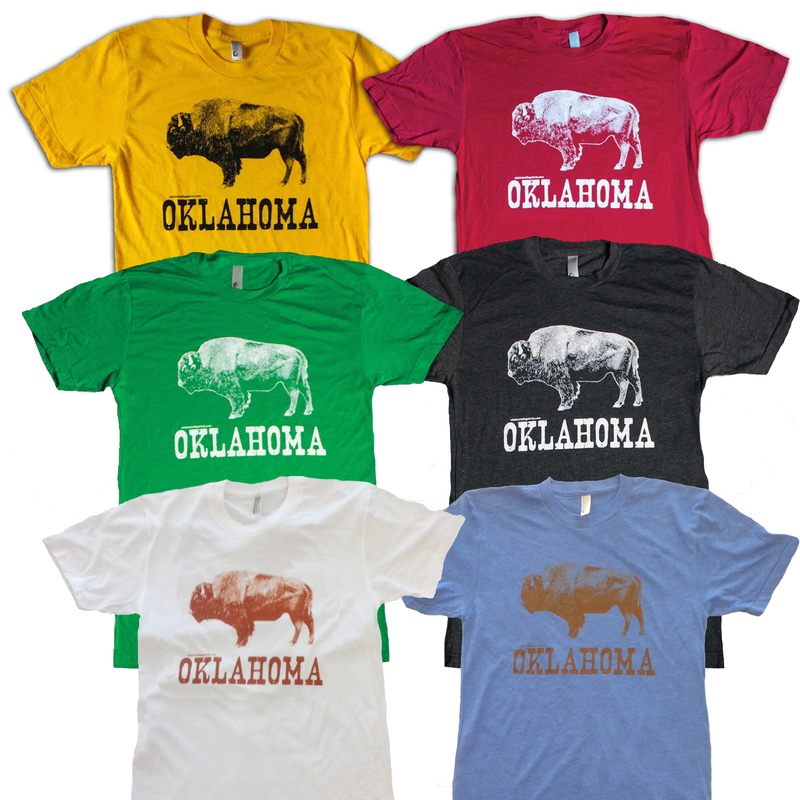 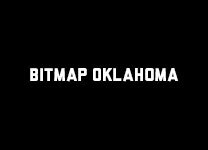 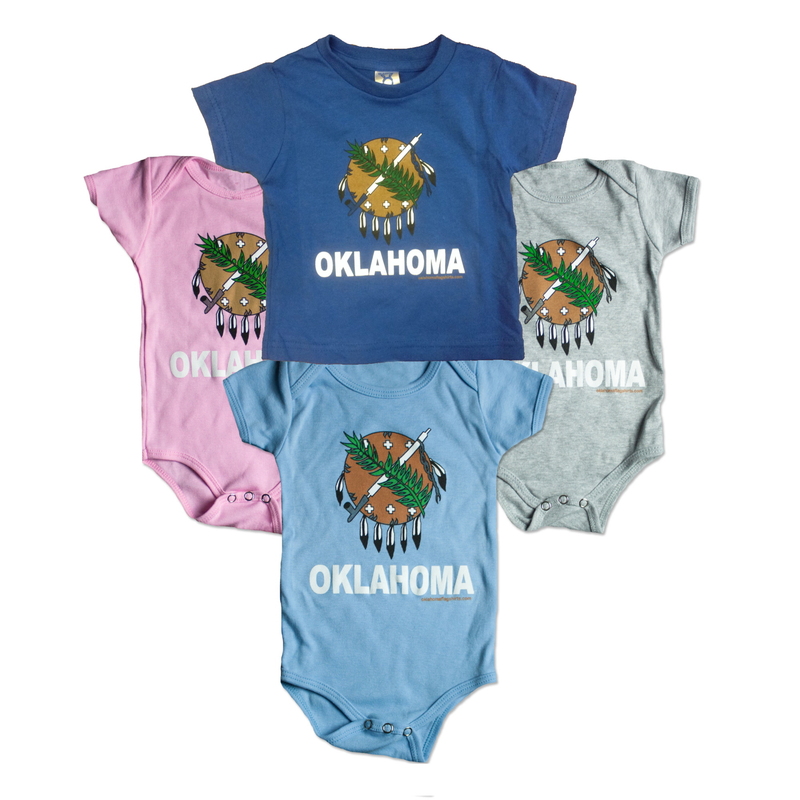 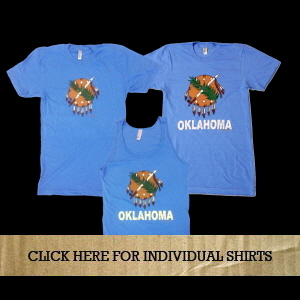 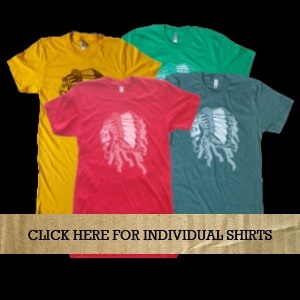 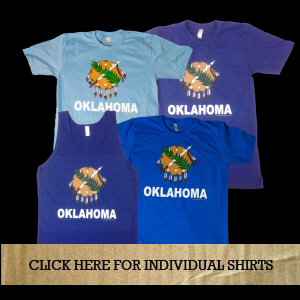 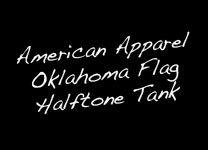 Whether you've lived in, passed through, or just had some crazy psychedelic dream about Oklahoma after zoning out to a Flaming Lips album, we have something you'll like, from our velvety-soft tees to our buttery-soft tanks, all from American Apparel. 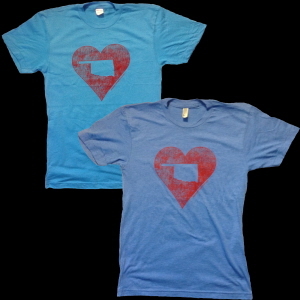 We love Oklahoma. 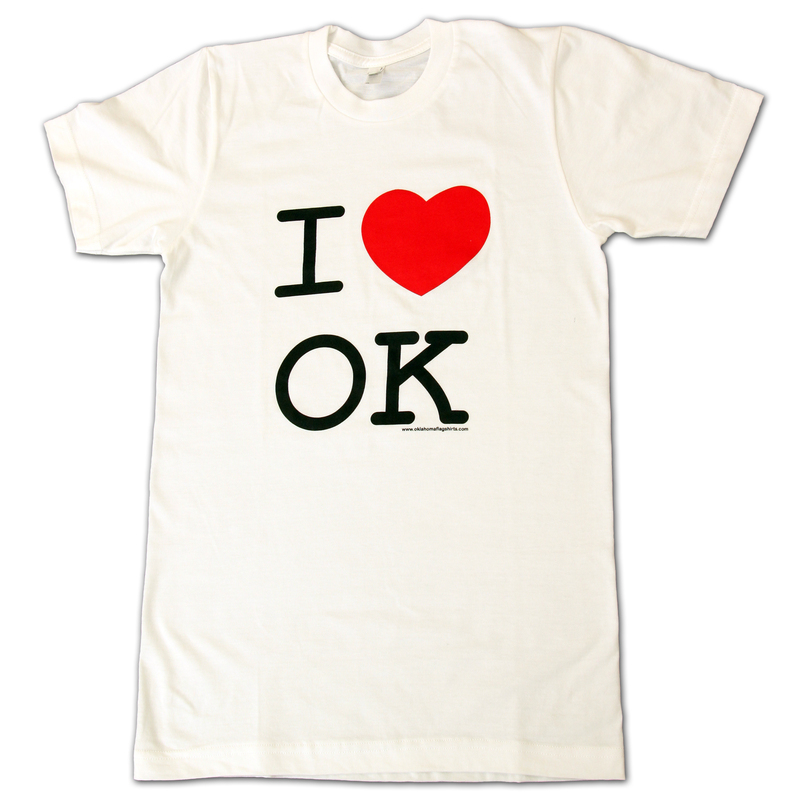 And we know you do too. 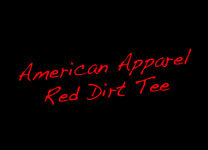 Don't be shy... Come on... Let the world know. 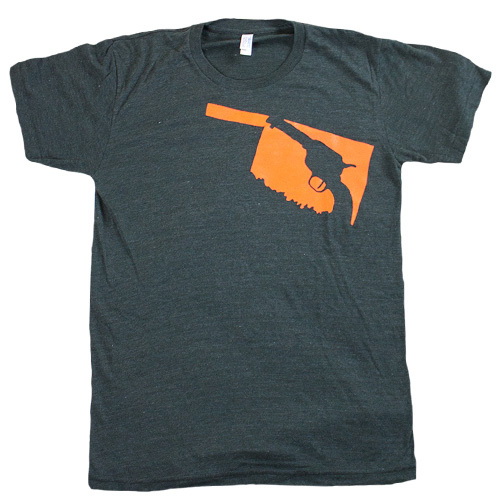 This shirt will last a lifetime, assuming a friend doesn't "borrow it" forever. 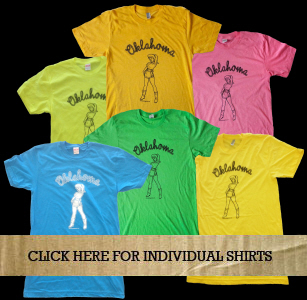 For those of you who, in the words of Bob Childers, are looking to keep "a low profile." 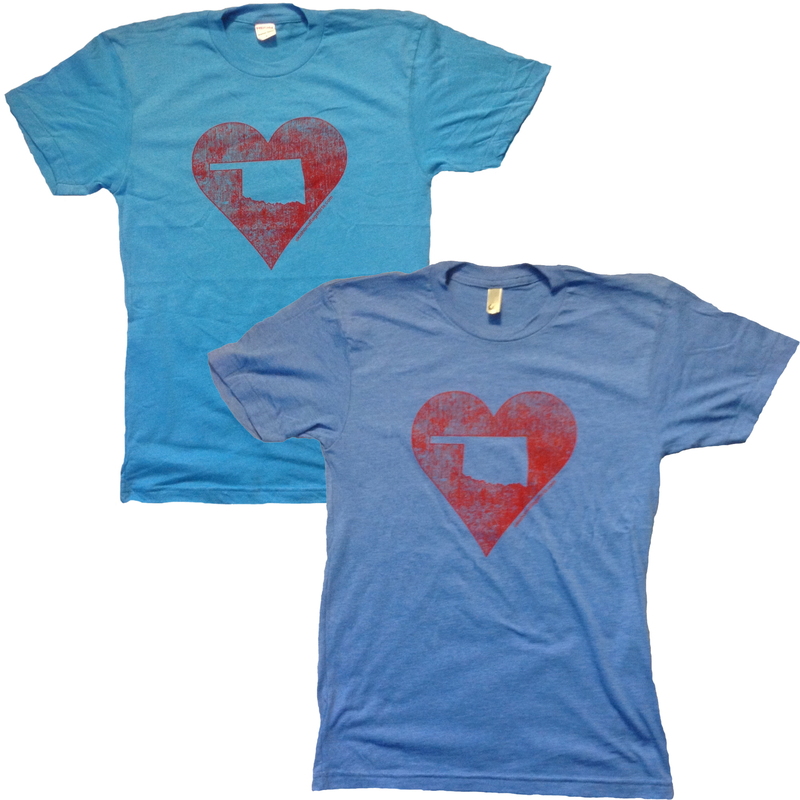 Our Classic design, distressed, on a super-soft heather blue tee. 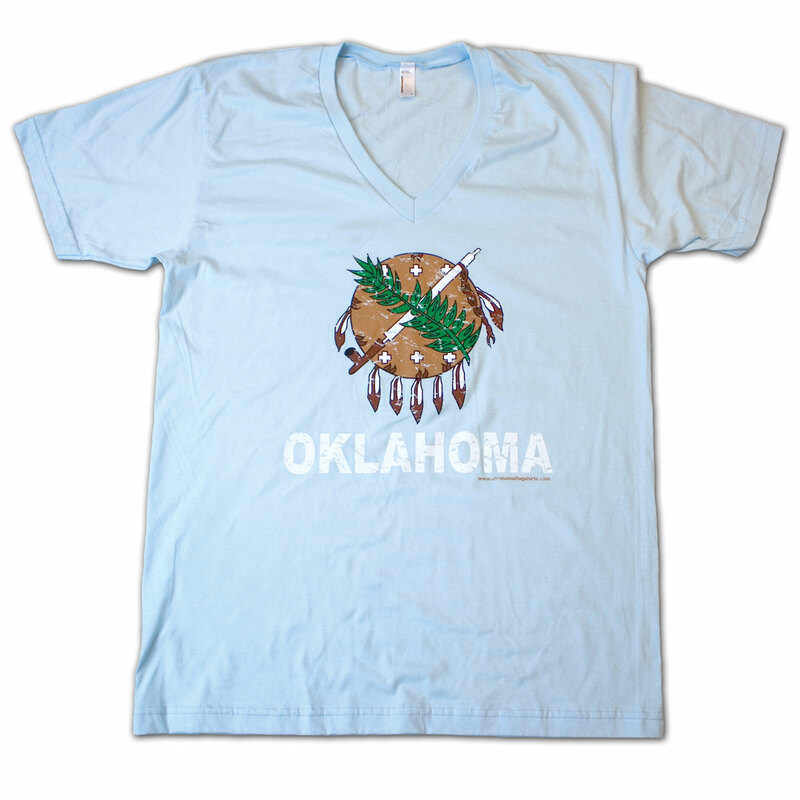 Our Classic design, super-faded on a buttery-soft blue tee. 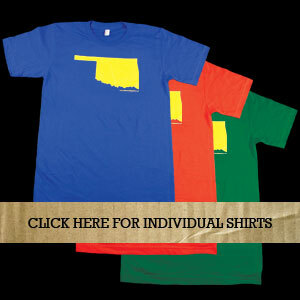 Simple and to the point, in bright and bold colors. 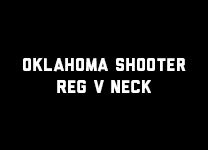 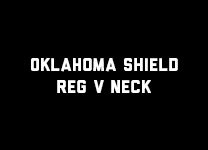 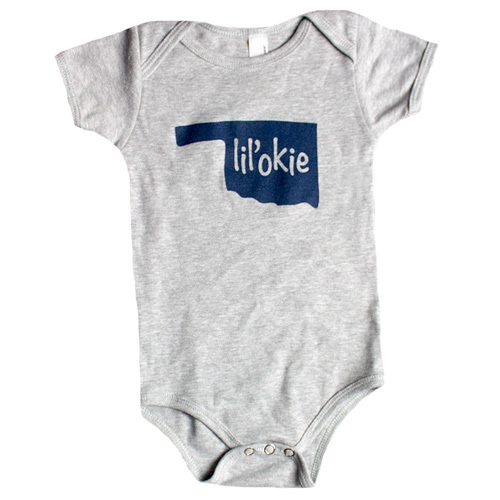 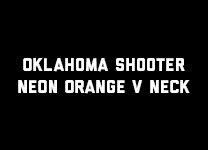 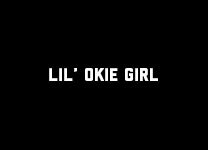 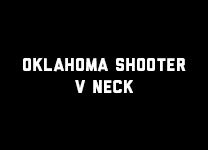 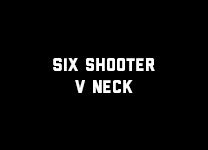 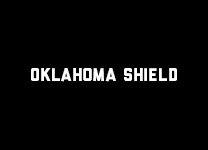 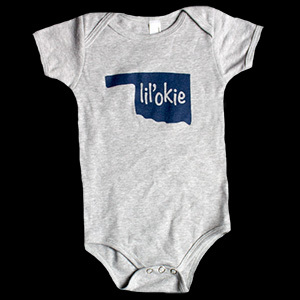 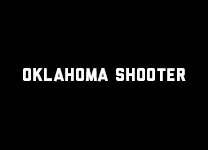 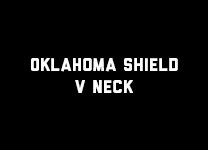 A little something for the young Okies. 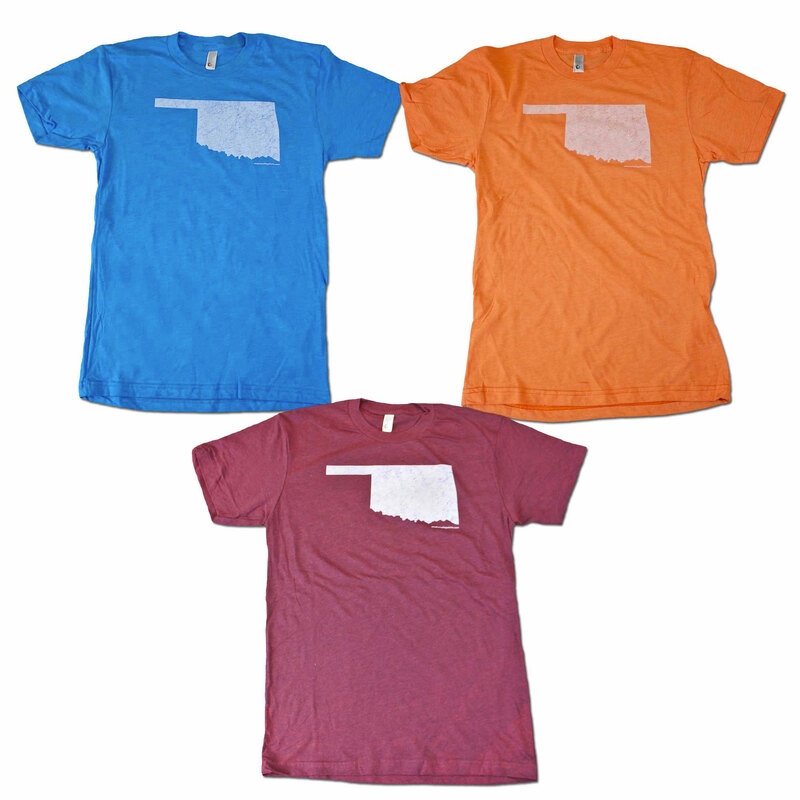 blue/gray/pink. 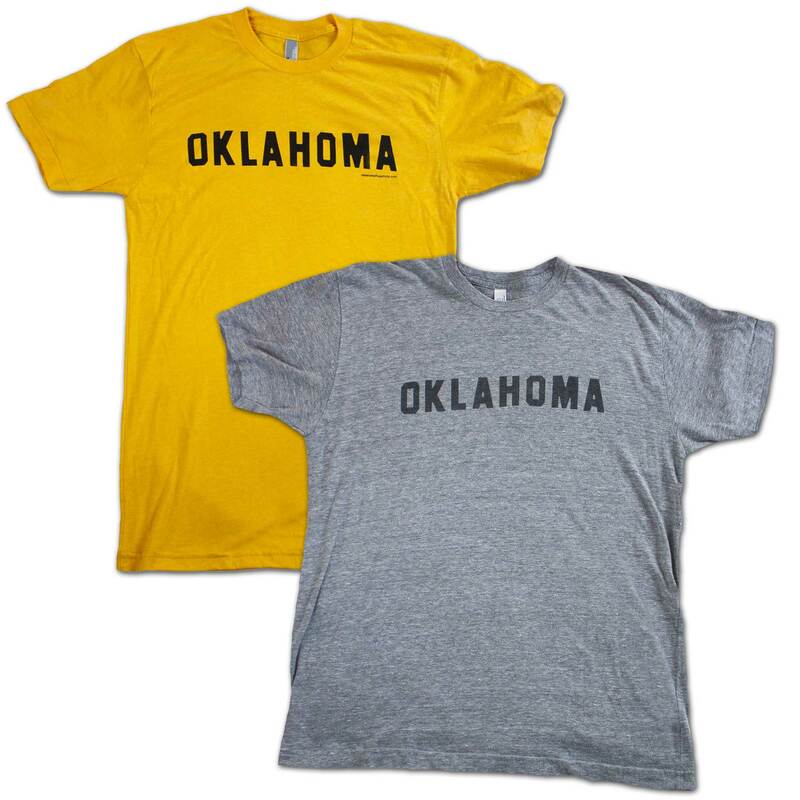 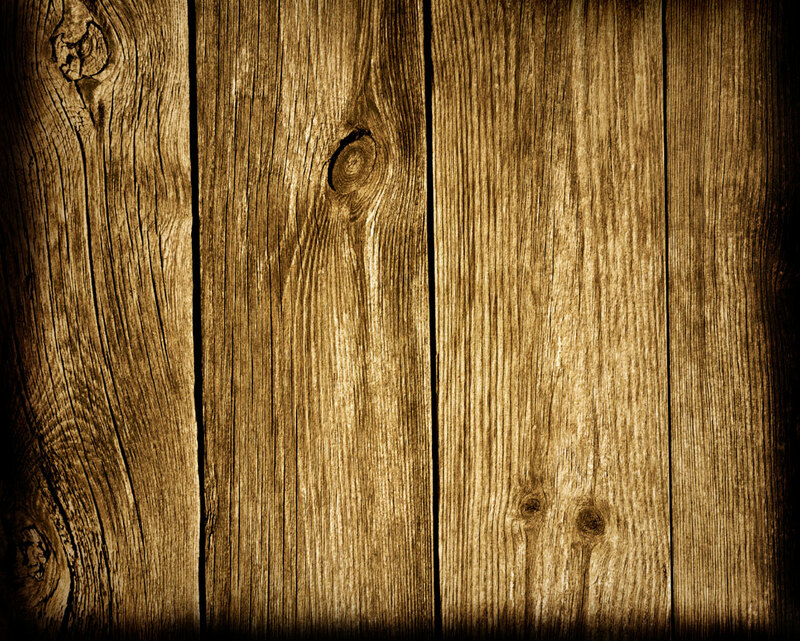 Simple and to the point, with a weathered and faded look. 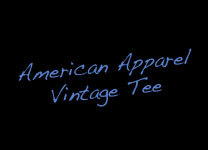 Pinups and rope text baby! 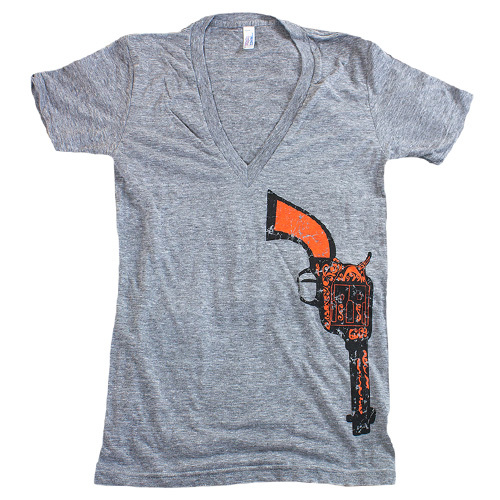 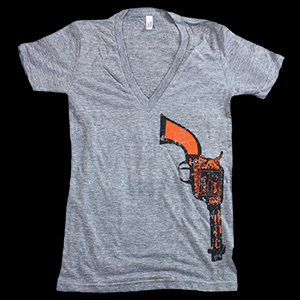 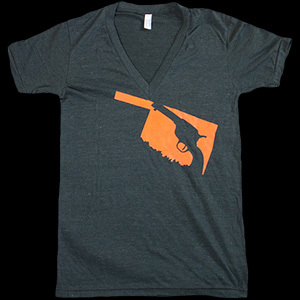 And on a soft and thin tee; what more could you ask for? 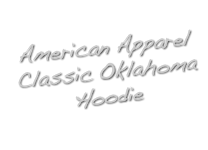 California fleece by American Apparel. 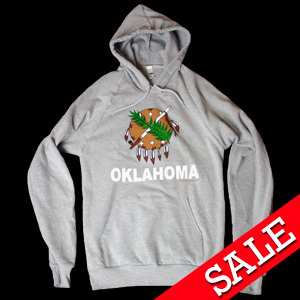 This hoodie is lightweight, warm, and soft. 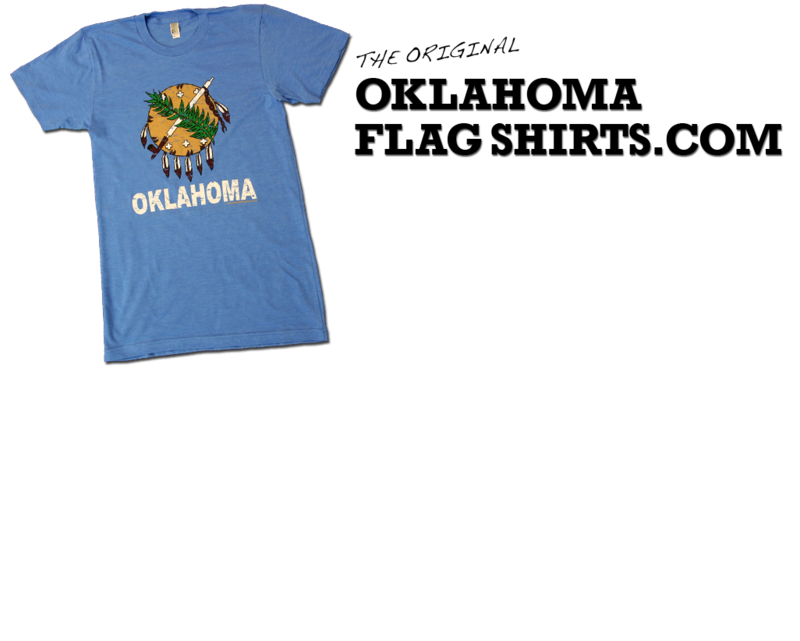 Oklahoma's first flag from 1911-1925. 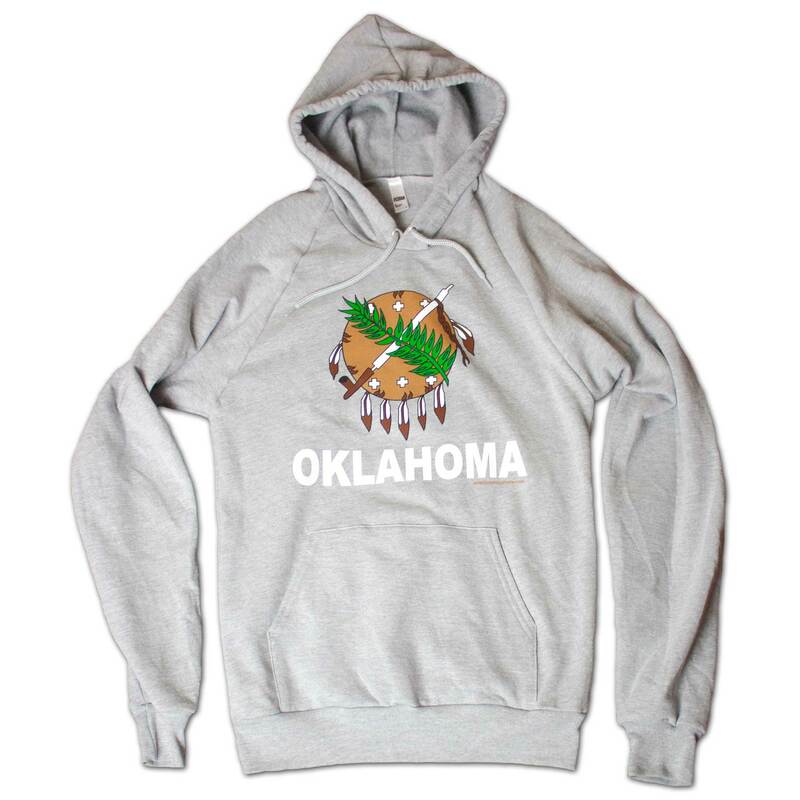 It's back from the past and looking as good as ever. 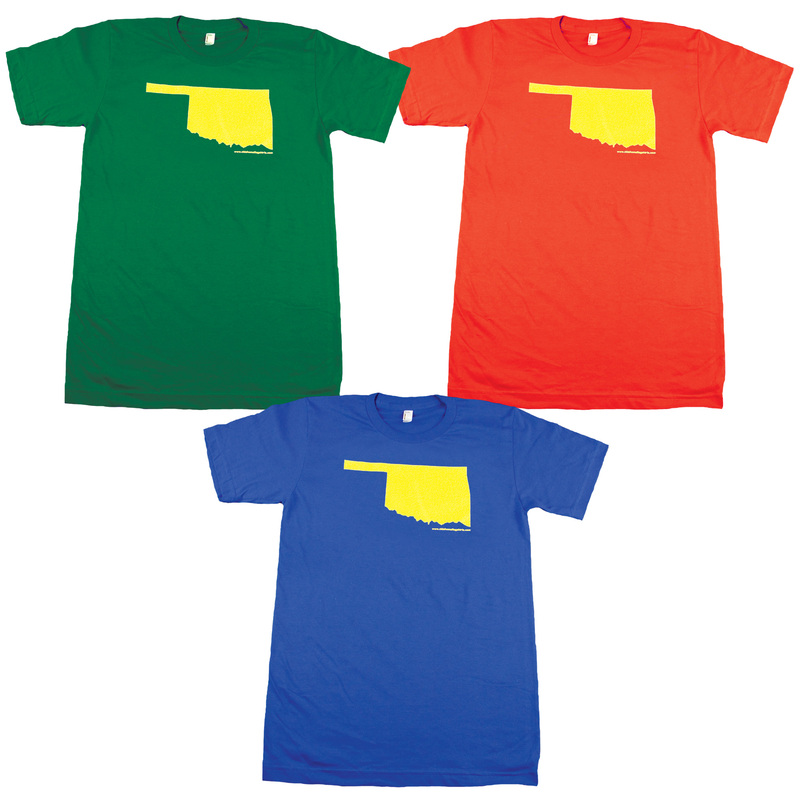 No offense to New Yorkers, but we'll take Oklahoma over New York City any day. 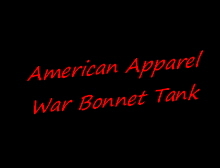 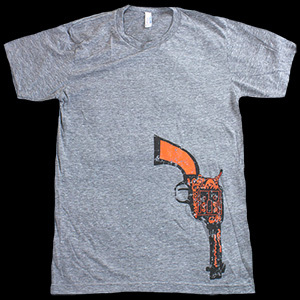 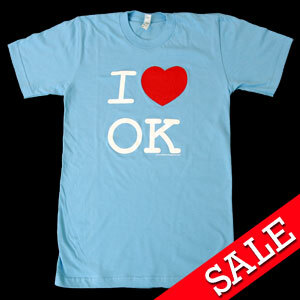 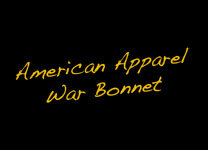 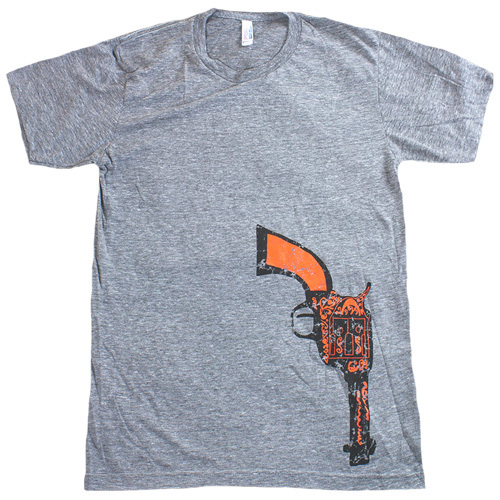 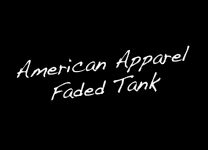 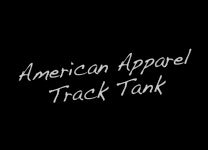 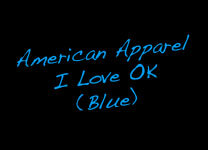 t-shirt, printed on a soft American Apparel tee. 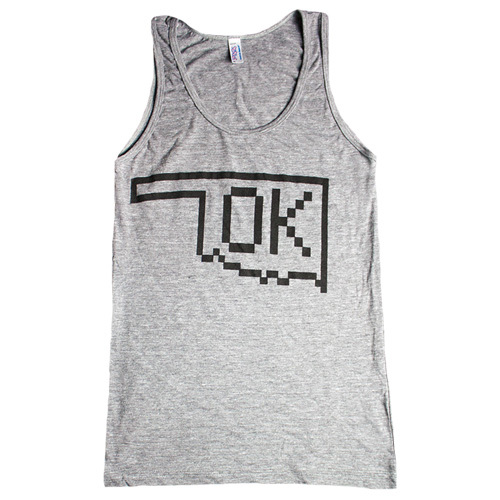 A buttery-soft, super-faded tank, in blue and heather gray. 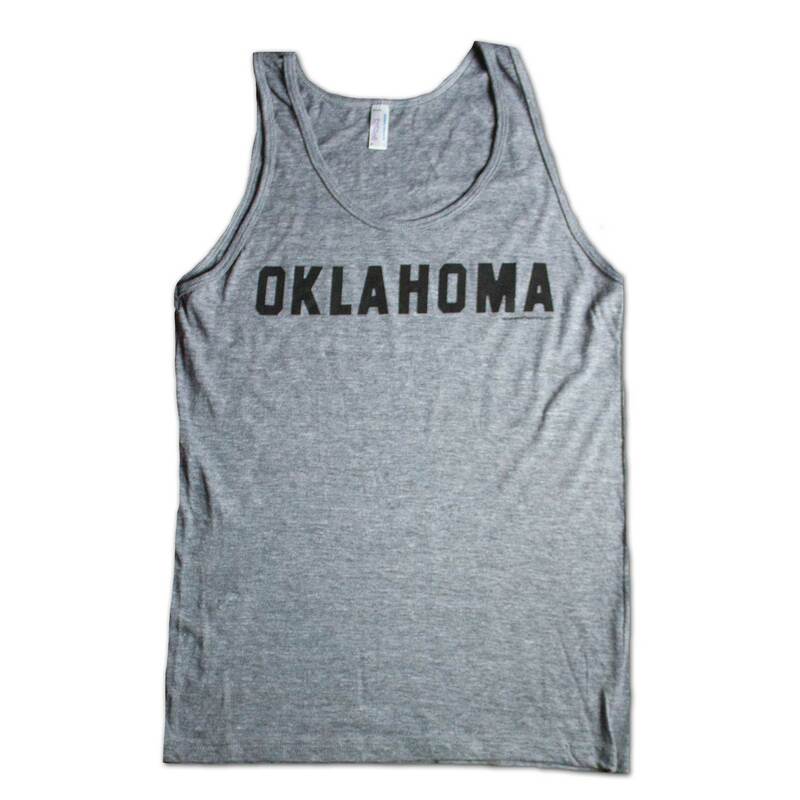 Great for an Oklahoma Summer. 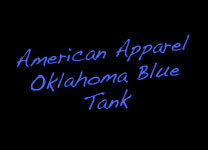 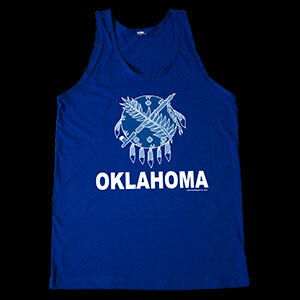 Oklahoma flag in halftones on a rich blue tank. 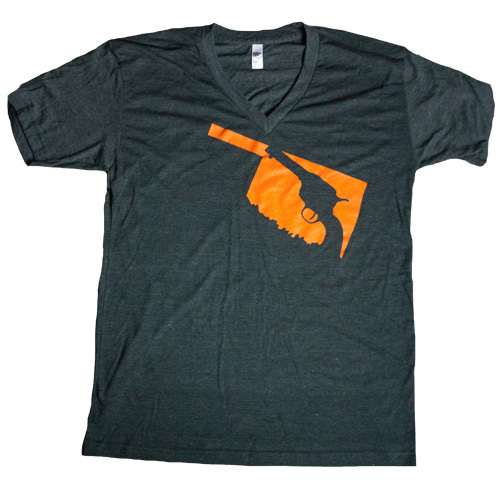 More generous fit than 50/50 cotton poly. 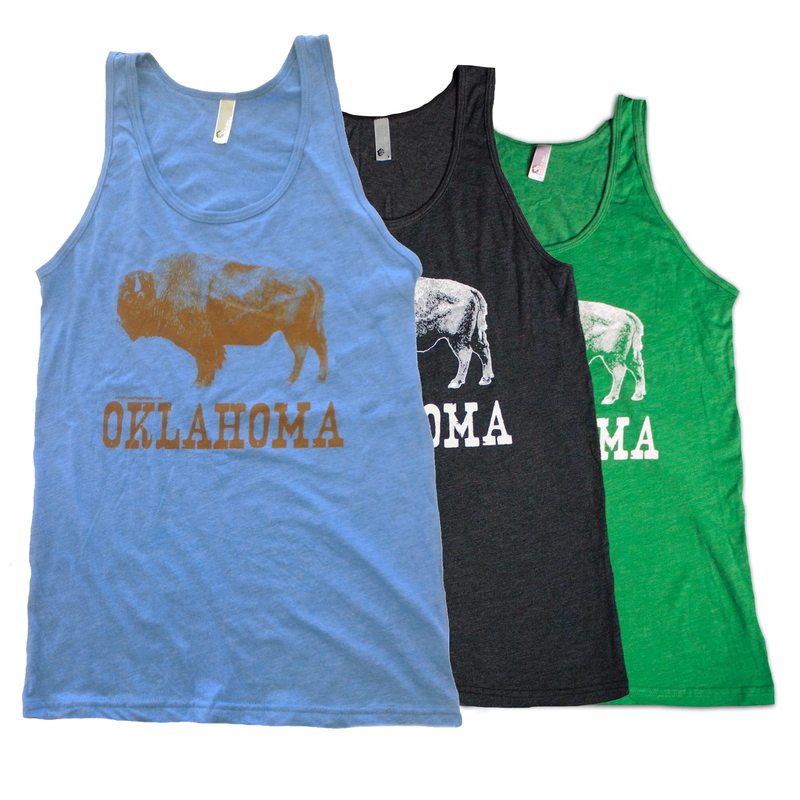 Buffalo, Bison, take your pick. 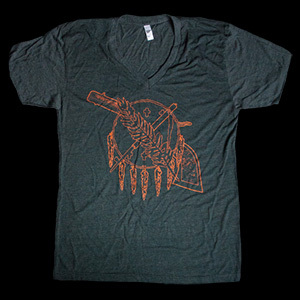 This is one rad shirt. 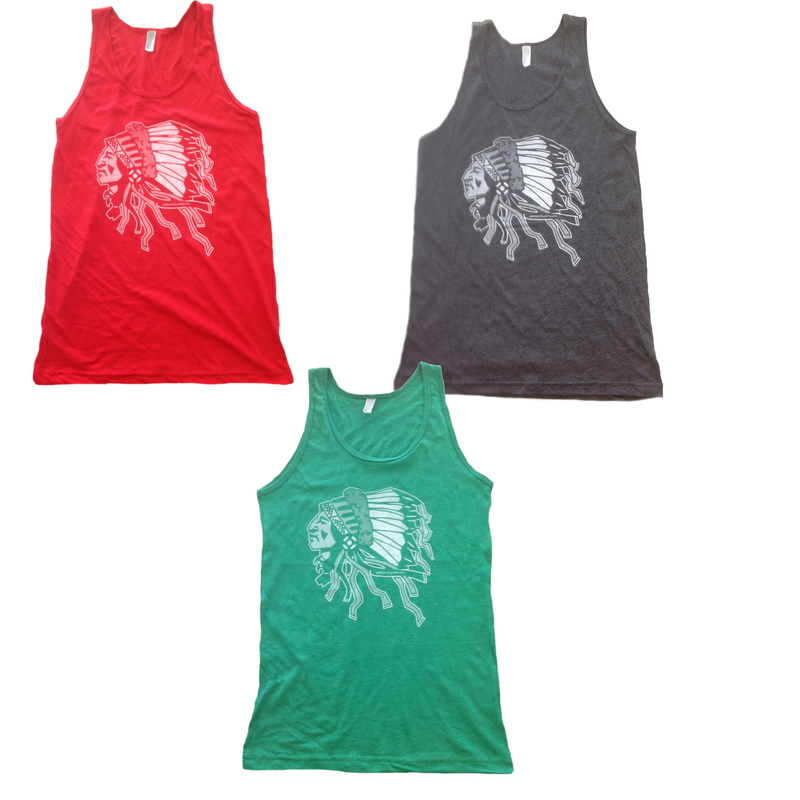 Buffalo, Bison, take your pick. 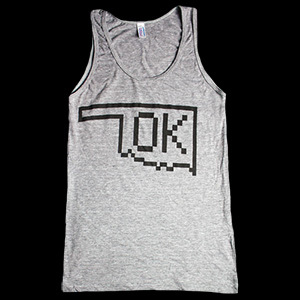 This is one rad tank. 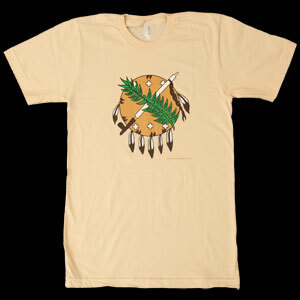 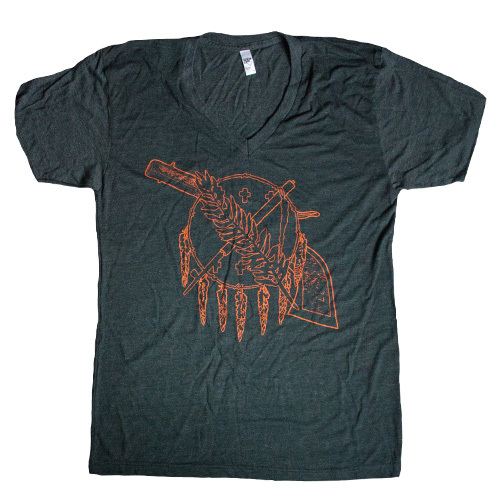 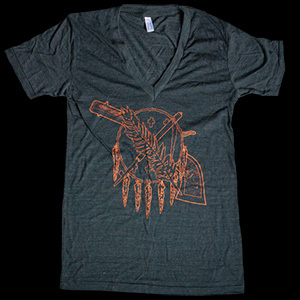 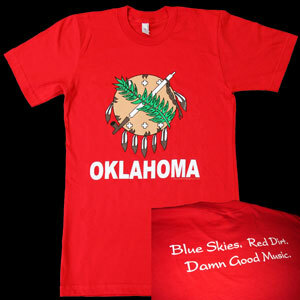 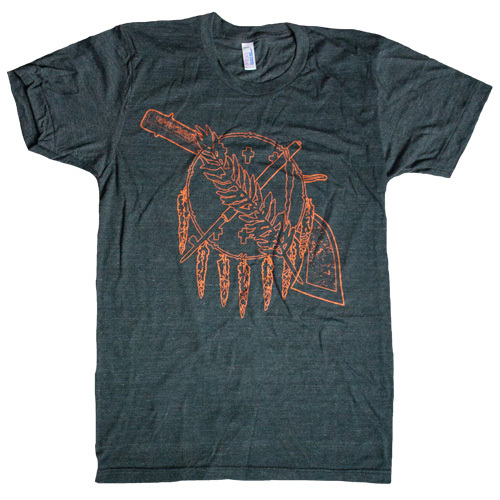 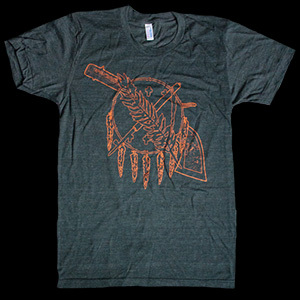 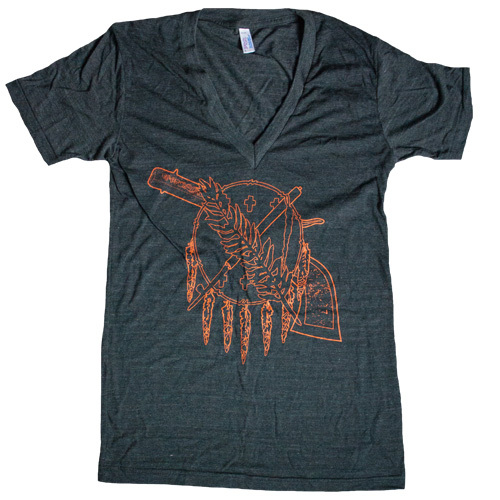 A tribute to Oklahoma's cultural heritage; Native American with War Bonnet in profile. 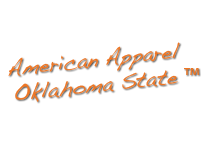 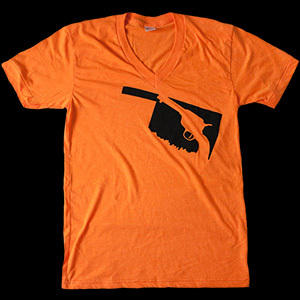 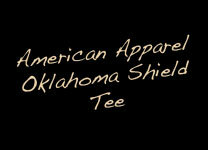 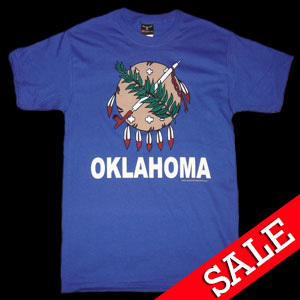 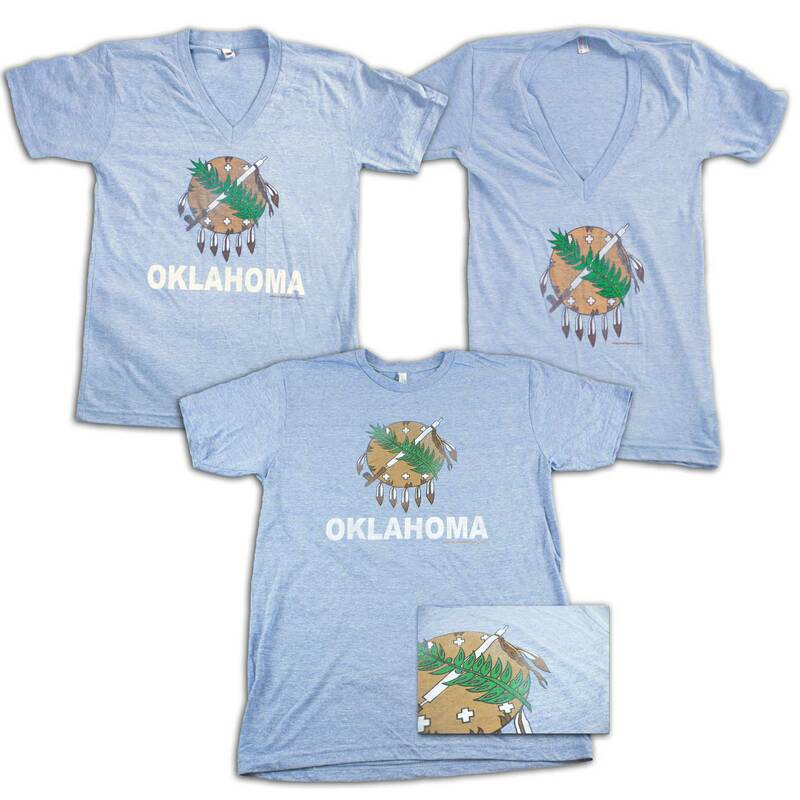 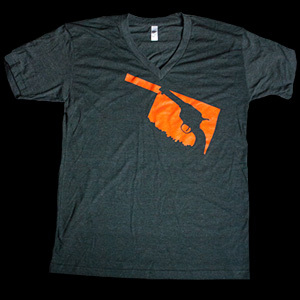 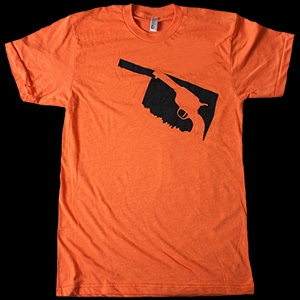 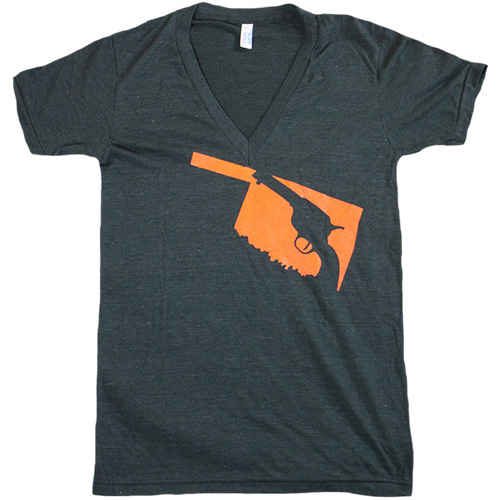 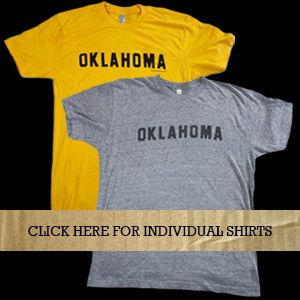 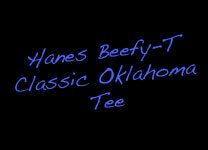 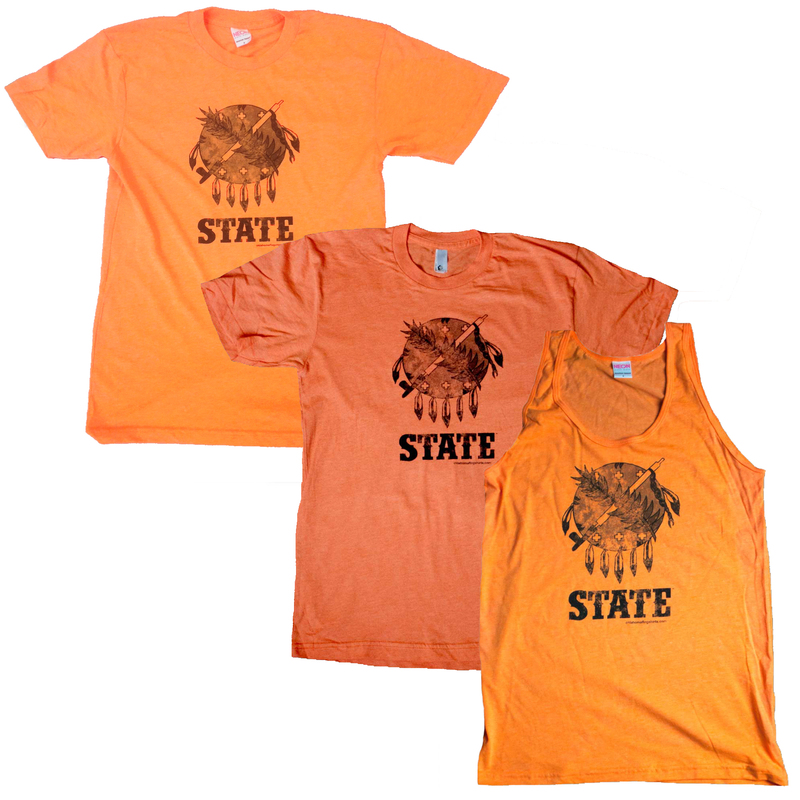 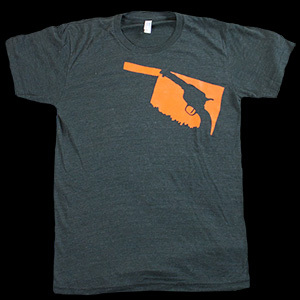 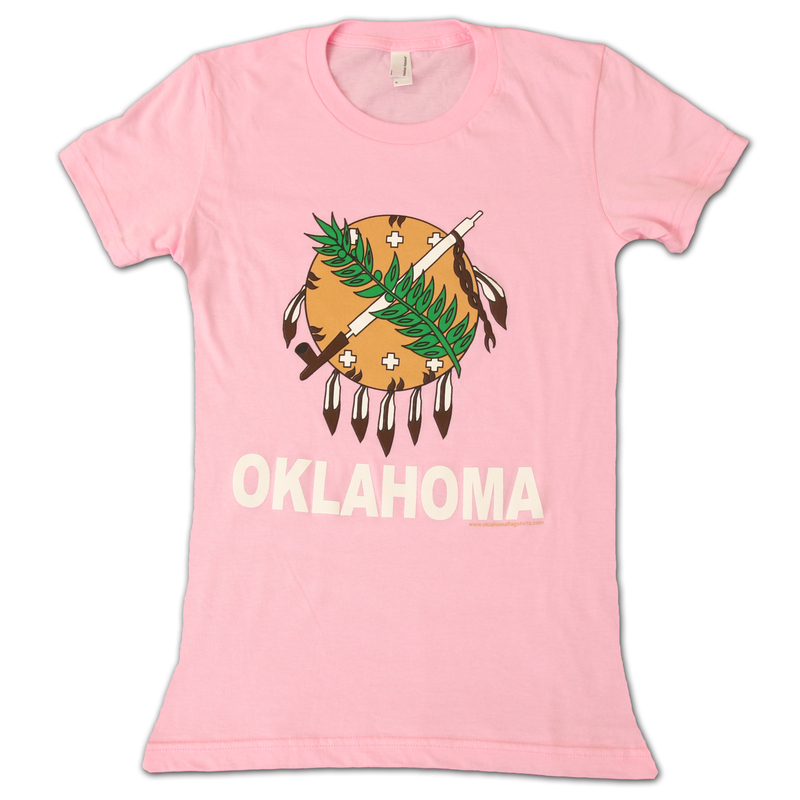 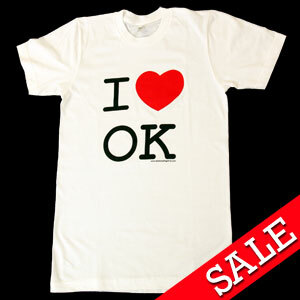 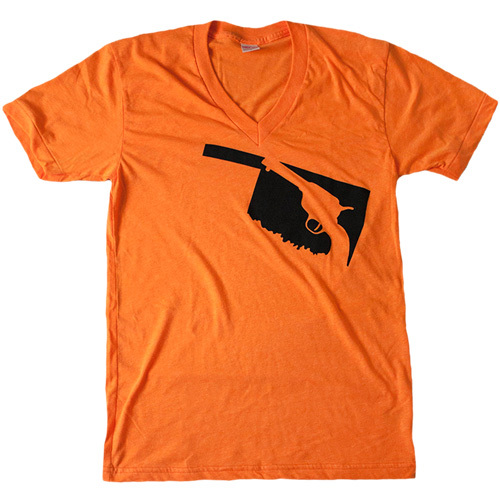 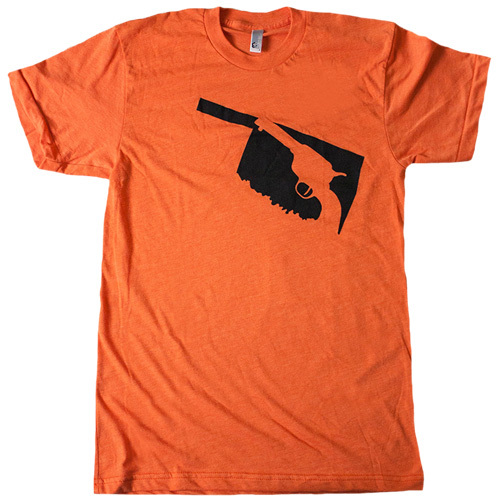 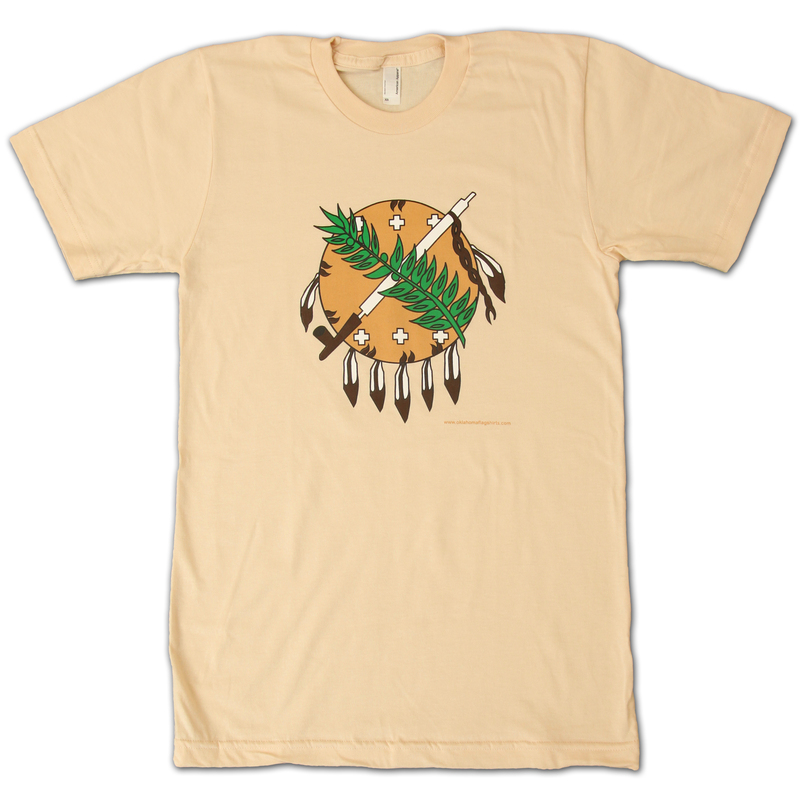 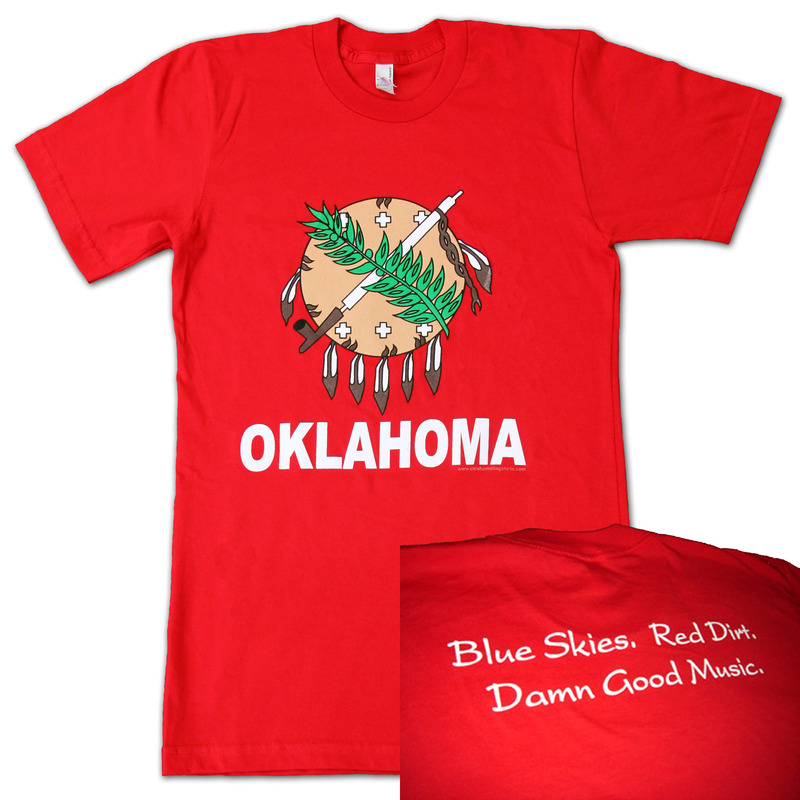 After loads of email requests-- an Oklahoma State University Oklahoma flag shirt. 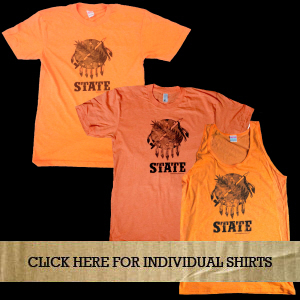 Go STATE! 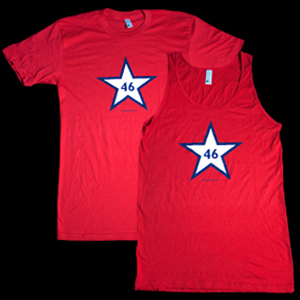 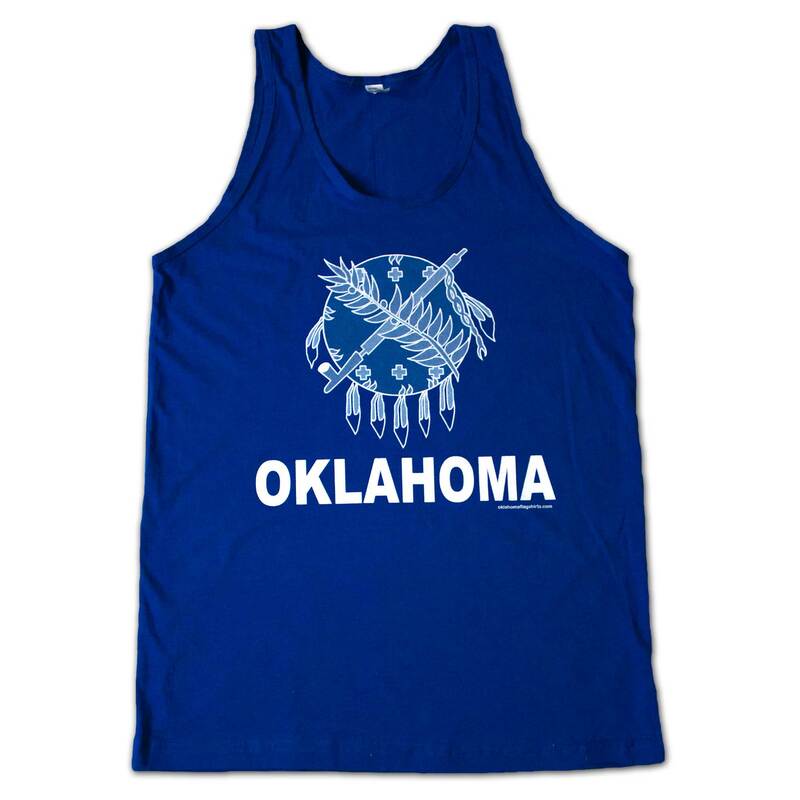 Does your girlfriend complain that you never tank off your Oklahoma flag tank? 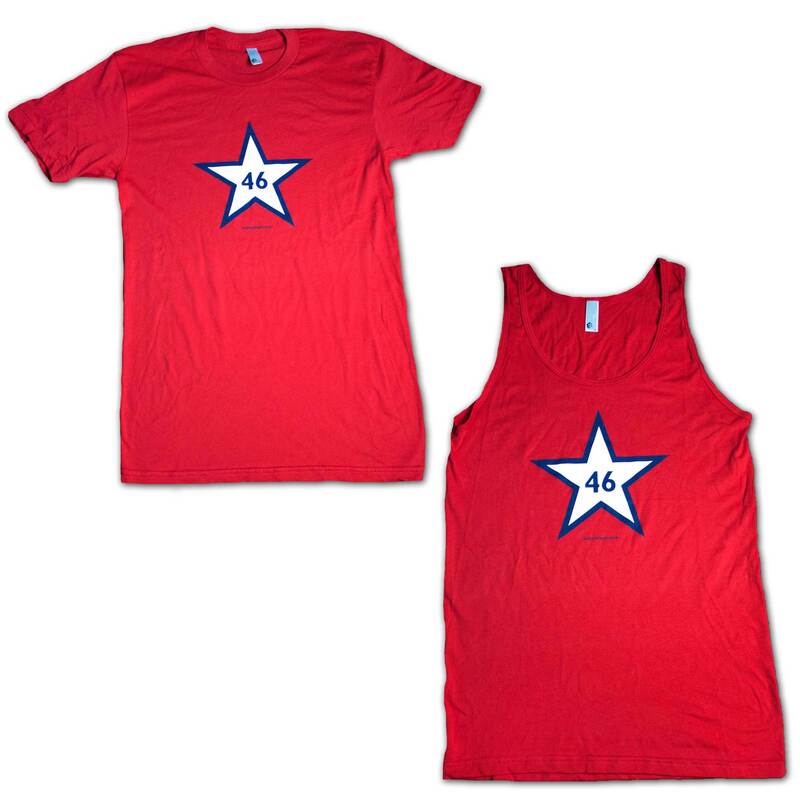 Does your girlfriend complain that you never take off your flag tank? 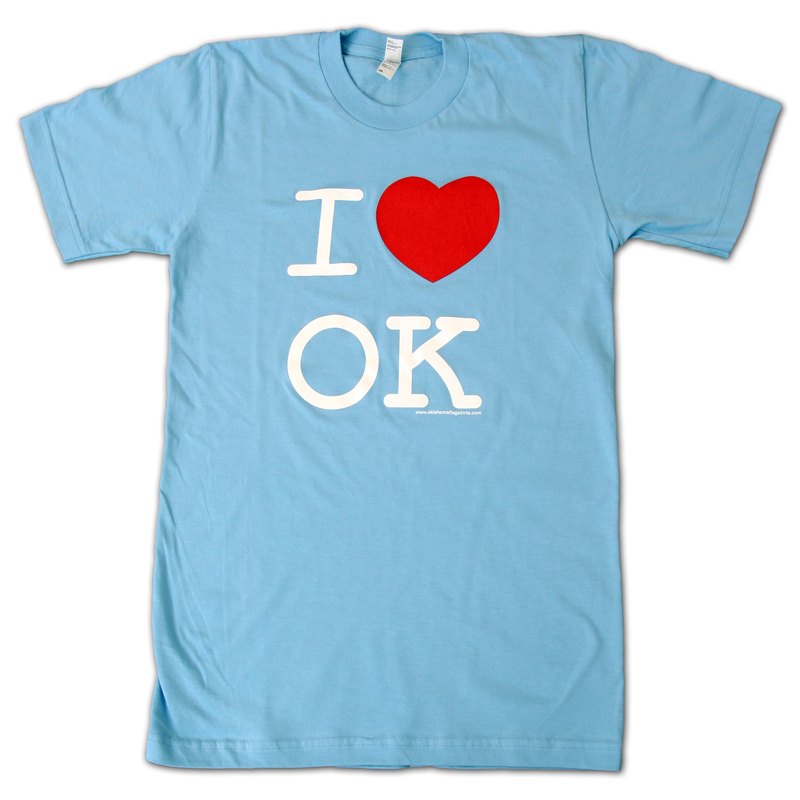 Ours do too. 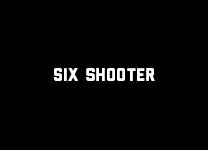 Try this one. 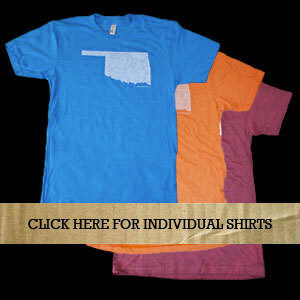 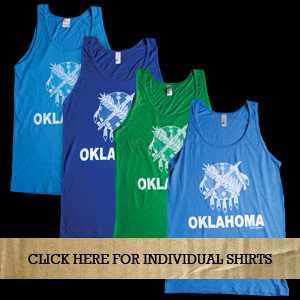 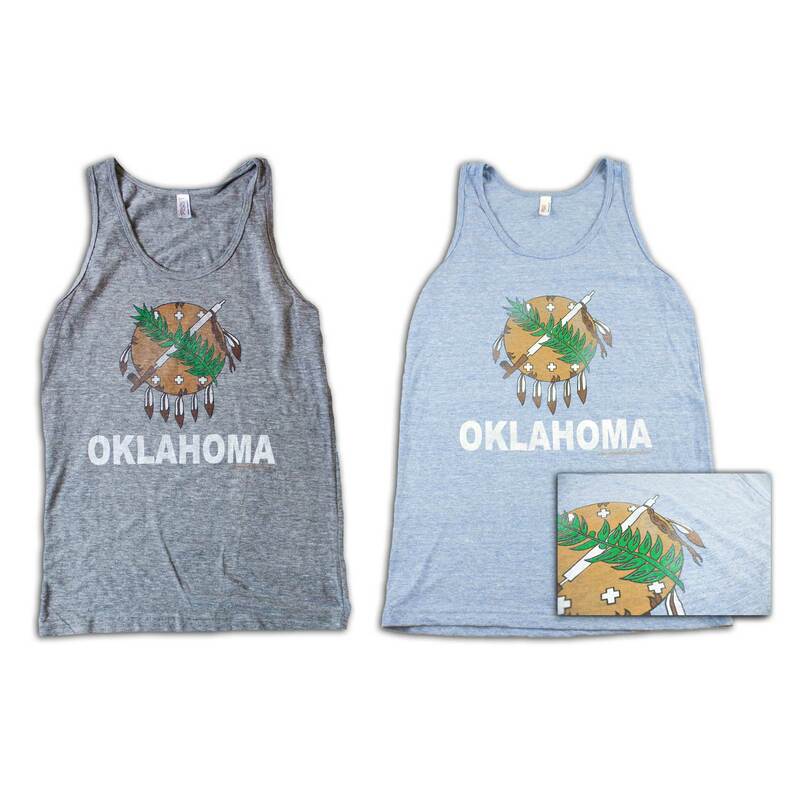 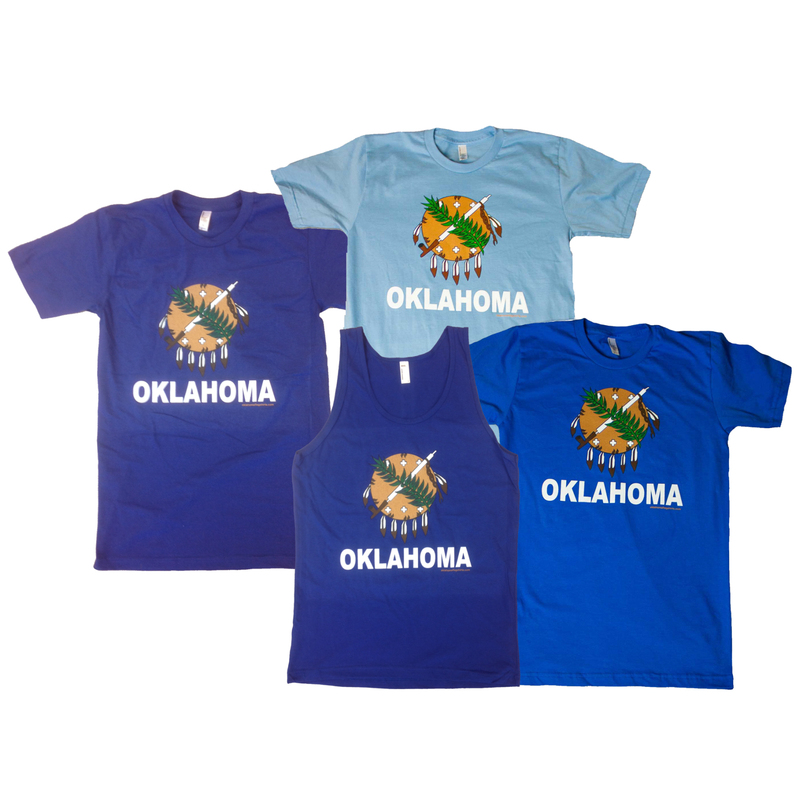 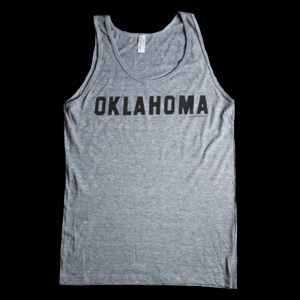 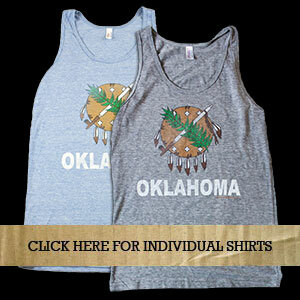 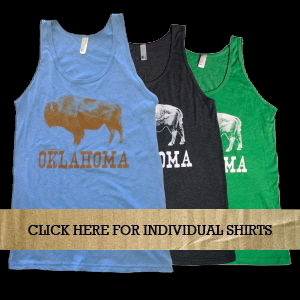 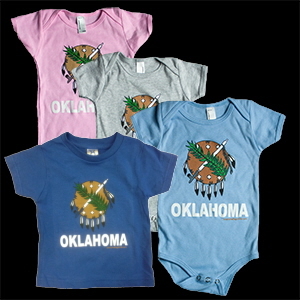 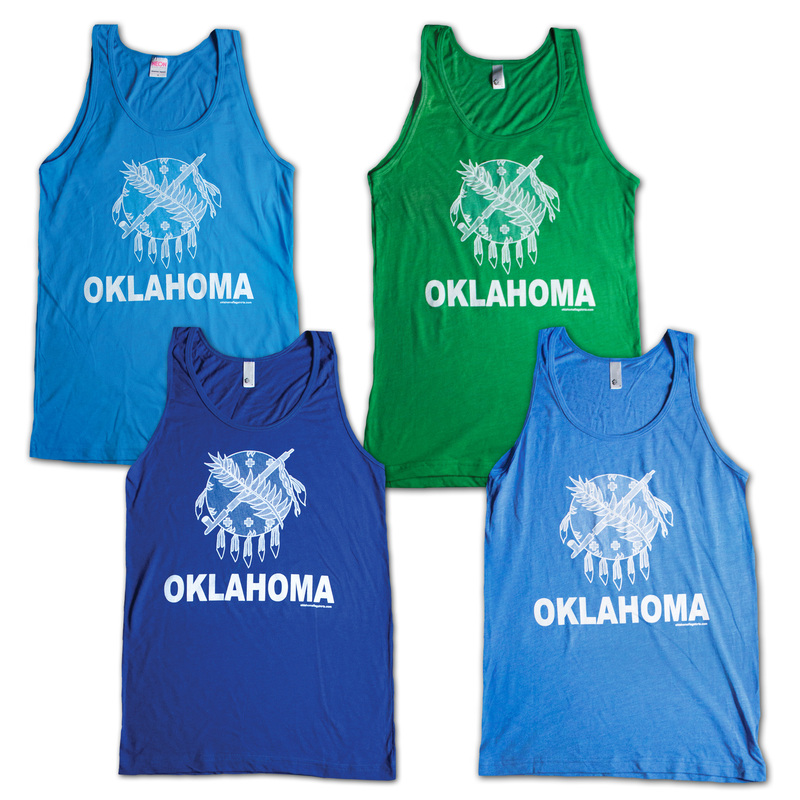 Oklahoma Flag tanks in halftones.